L'il Dee's Crafting with a Kitten: Stuffed to the Brim! That is the state of my craft room....I'm totally not complaining (it isn't all craft stuff LOL) but I do have to start using up more of my supplies. I have been trying to use up more patterned paper over the last few months. That is why I started my challenge to myself last November (at least 2 new projects a week using patterned paper). Well I've managed to keep up with that challenge but now I want to throw some other stuff into the mix. On at least 1 project a week I will also have to add brads, buttons, ribbon, pearls or flowers (One of these items not all...I still want to be able to fit the card in the envelope LOL) I'm not adding rhinestones to this list because I use them all the time. But seriously I have a drawer full of flowers, tons of ribbon, bottles of buttons and several packages of pearls. I really need to start adding them to my projects. It really is funny, just like the paper I keep thinking "Oh do I really want to use this up on this project...maybe I should save it for something special" which never really comes along and then the stuff keeps sitting in the drawers waiting. Oh and I need to ink up a bunch of my new stamps and use as well. 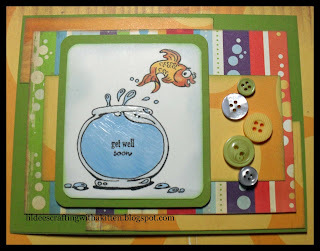 Anyhow for today's card I used an image I had already colored a long time ago. I apologize I really don't know where the image is from or what colors I used for it. I have a bunch of digis and stamped that I did at a crop over a year ago and I also borrowed some stamps from friends. I do know that I used prisma color markers on this image. A couple of weeks ago I got a new stamp set called Celebration Pennants from Whimsy Stamps and I used the "get well soon" stamp and black memento ink to add the greeting. I also colored over the entire fish bowl with a clear glaze pen. Now I could have used glossy accents for that but I have a real problem with air bubbles every time I attempt that (so now I just use that on really small areas LOL). The patterned paper is a from the Cosmo Cricket line Snorkel (which is from 2009 - or so the date says on the bottom of the paper) and I used both sides of the same paper on this card. I used a corner rounder on the image and mat and edged the various papers with a variety of versa magic inks persimmon, pumpkin spice, tea leaves & aspen mist. I popped the image up on 3d dots and added the buttons with glue dots. OK it is getting late especially since I have to set the clock ahead an hour tonight. I hope to have another project to post by Monday. Until then have a great Sunday and happy crafting everyone! Dee, this is really cute. I love the bright colors and buttons.